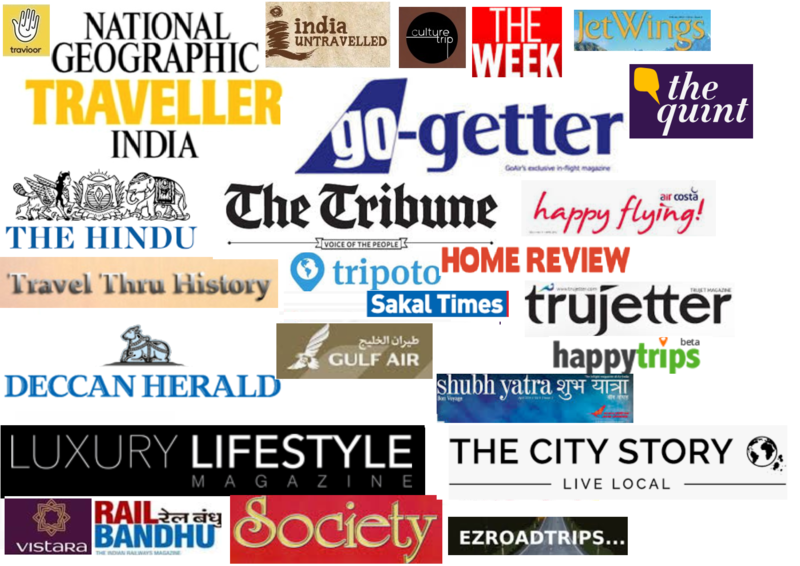 The main entrance to a house or any establishment for that matter, is according to me, a very important space as it creates the ‘first’ impression and a well maintained, neat aesthetic space is always ‘inviting’ and feels ‘welcome’. 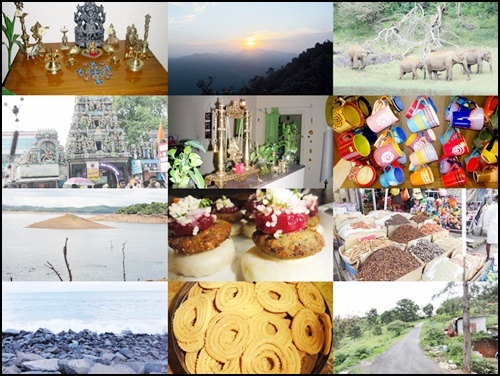 Fengshui and vaastu experts would tell you that it is the most significant area as it is through this space, that energy flows in and helps keep the house healthy and prosperous. 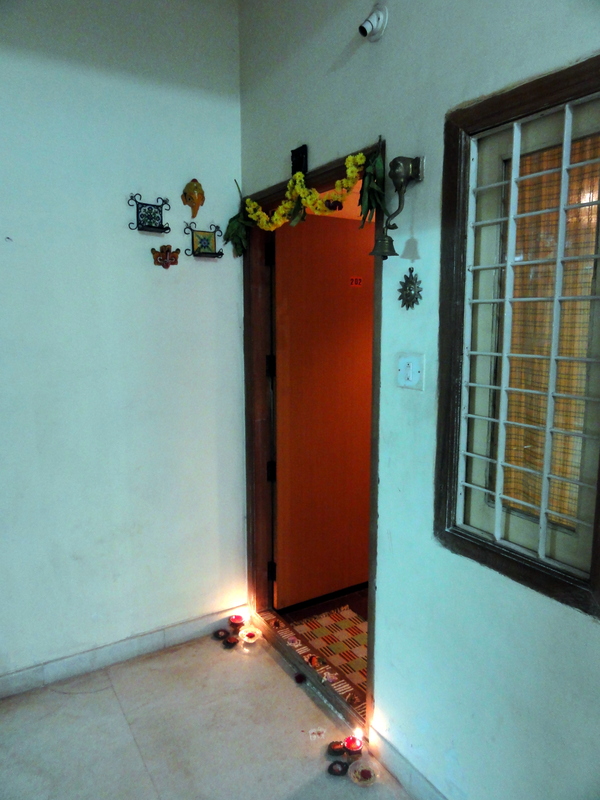 Like all Indian households, the main entrance of the house including the threshold is a sacred area for me and I make it a point to decorate it with flowers, mango leaves and lamps on festivals and special occasions. I also try my hand at drawing Rangoli during these days, though, I must admit that my skills for the same are grossly inadequate! For a long time, the entryway to my apartment was too ‘plain’ for my liking and I had been wanting to make it vibrant and of course colorful. 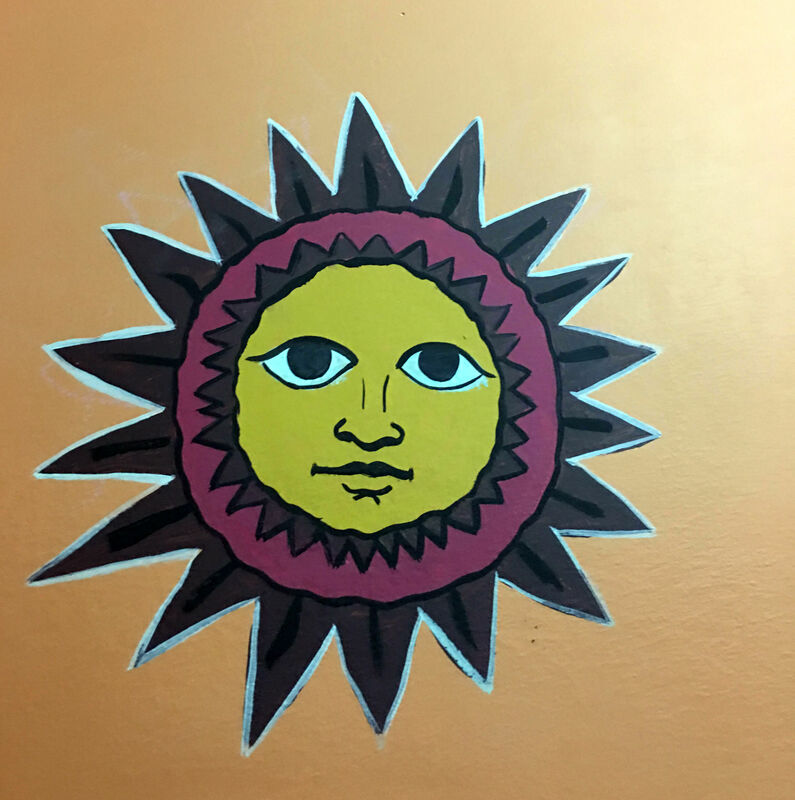 I initially thought of adorning the walls with paintings of the Warli form of art, however I decided otherwise as I found it being used in places quite frequently. Also Warli is done using the main colors of brick,white and sometimes black. 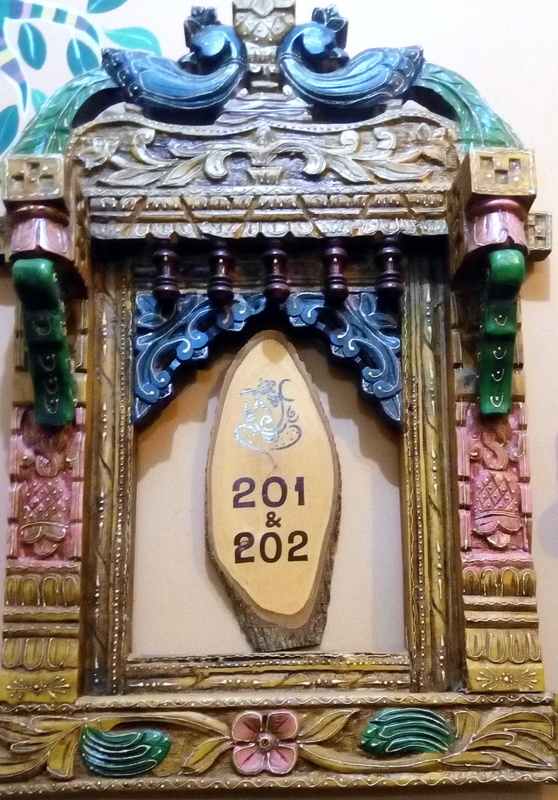 I had bought a colorful artefact which I hung on the wall of the entrance as a frame to my prized, much cherished and of course ‘custom made’ number board. So I wanted something in the same color scheme so that it would go well with the frame. 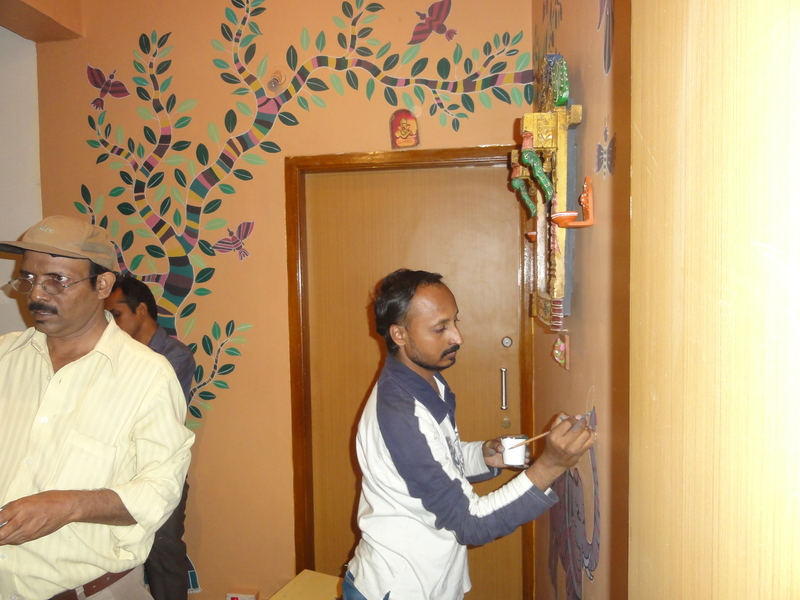 Before this, I had got the wall painted a shade of rust-brown, so Warli art on that background was a definite no. 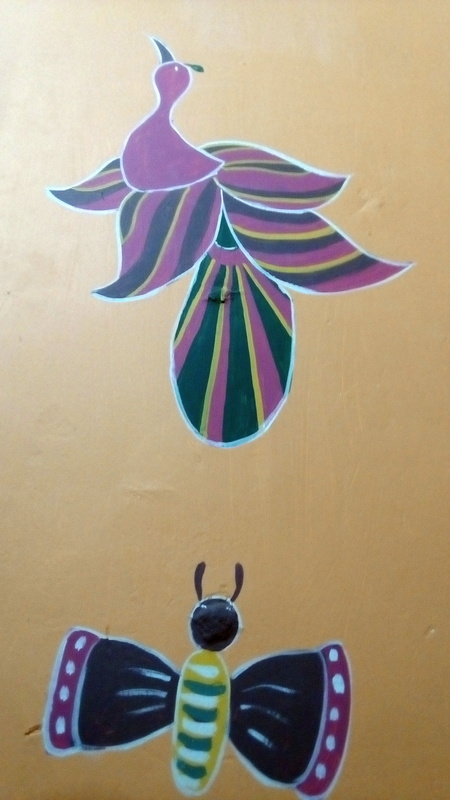 After much ‘search’ and research, I happened to meet the wonderful yet unassuming artists at Benakams. 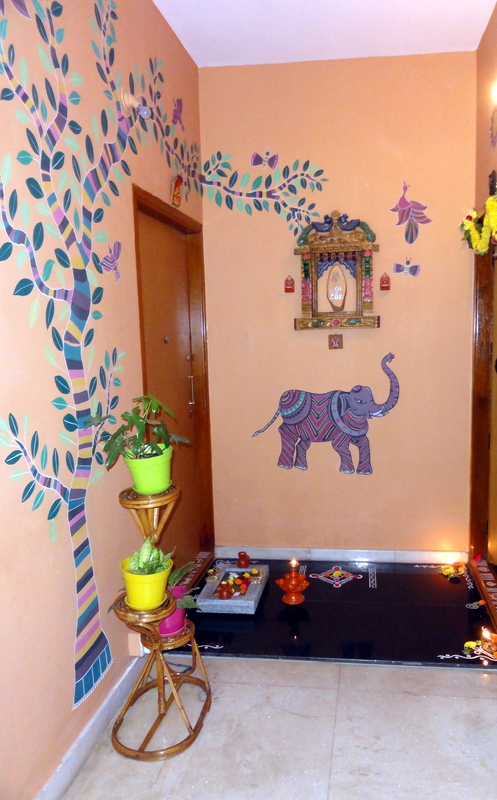 They agreed to paint the entrance wall and while I just gave them some basic ideas and guidelines, they did a truly wonderful job in transforming the space. 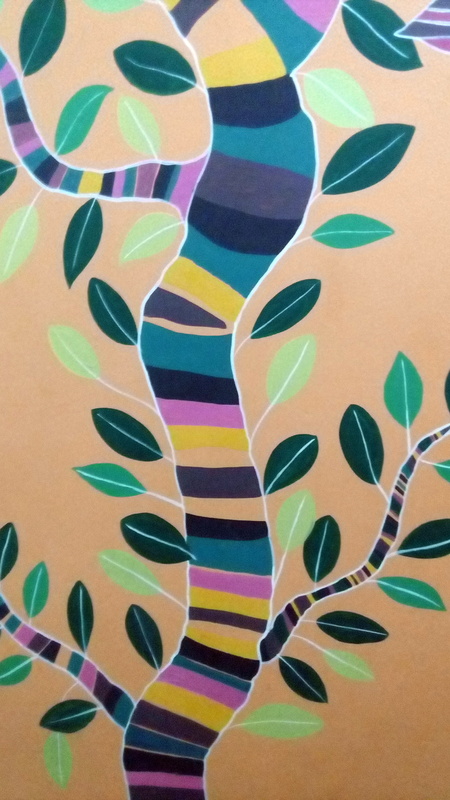 They conceptualized an absolutely beautiful ‘tree of life‘ image in the Karnataka folk style incorporating all elements that signify energy and positivity including the sun, birds and butterflies. 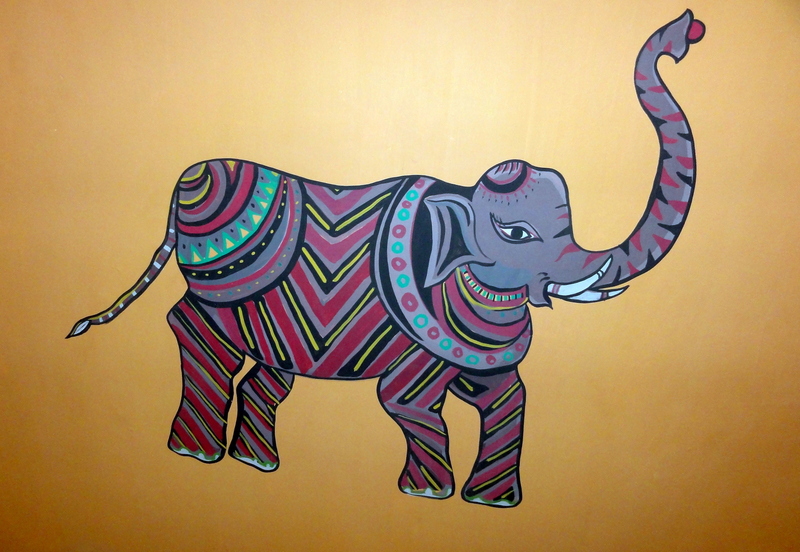 The colors they used were just spot on and my favorite was their rendition of a hypothetical creature which is a cross between the two most sacred animals in Hindu mythology, the cow and the elephant. 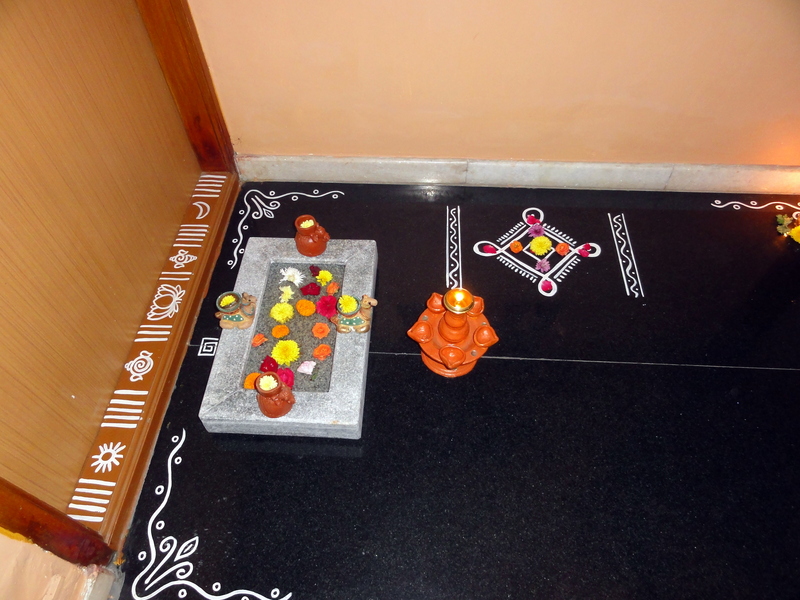 They even painted a simple yet elegant rangoli on the black granite slab I had got installed at the entrance on my request. I just love the end product and it is one of my favorites ‘house projects’. I cannot thank the artists enough for this magical makeover! very nice decoration there with full of creativity! Very nice and authentic decorations! You completely transformed it. This is beautiful!